Visit Chicago with your group as autumn effortlessly transitions into winter and you’ll be catching the city at its most breathtaking. 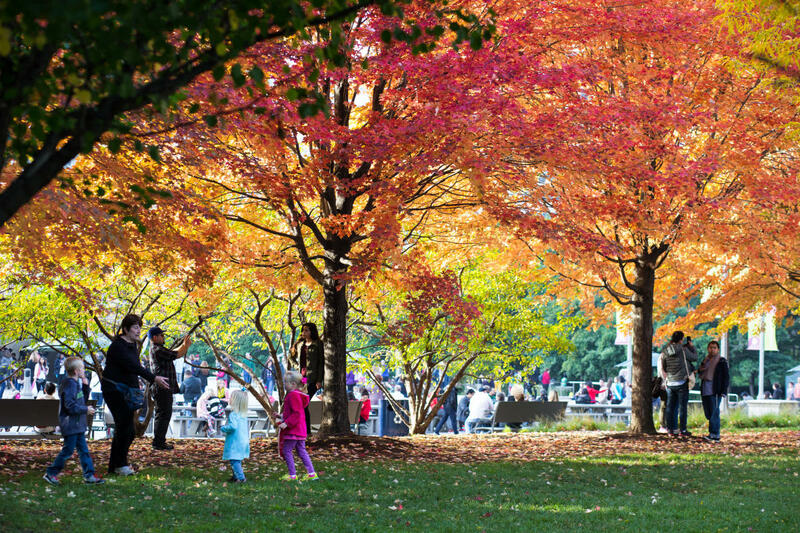 Beautiful lakefront parks and gardens around the city are the perfect places to spy fabulous fall colors. And as winter ushers in, sparkling holiday lights are on display everywhere from The Magnificent Mile to Lincoln Park Zoo. Here are some of the best spots in Chicago for groups to see awesome fall colors and holiday lights. Millennium Park is a leaf peeper’s dream, with blazing fall colors adding even more drama to the reflective Cloud Gate sculpture and multimedia Crown Fountain. Be sure to make your way to the southeast corner of Millennium Park and the award-winning Lurie Garden, where you can arrange for a private group tour of the grounds. Here you’ll discover a picturesque floating wooden footbridge that leads to more than 200 different kinds of plants and flowers tended to by busy bees from nearby hives. Arrange a private group bicycle tour with Bobby’s Bike Hike and peddle along the scenic Chicago Lakefront Trail, which spans 18 miles from the south to the north sides of the city. You’ll see fiery fall colors bursting from beautiful parks along the way (including Lincoln Park) or catch an autumn sunset over the glittering waters of Lake Michigan. Make a stop at Northerly Island, a 91-acre manmade peninsula that juts out into the cool blue waters of Lake Michigan and features winding strolling paths that meander through native prairie grass and colorful wildflowers visited by fluttering butterflies. Create a customized private tour for your group with Absolutely Chicago Segway Tours and glide effortlessly through the autumn colors in Grant Park, a 300-acre oasis in the heart of downtown Chicago. Lush gardens shimmering with fall jewel tones of ruby and amber dot the park, but the main attraction is the centerpiece Buckingham Fountain. Unveiled in 1927, the ornate fountain festooned with sea horses is one of the largest in the world. Catch the nightly display of colored lights and music choreographed with the fountain’s dancing waters through mid-October. Join the Chicago Architecture Center’s Walk The 606 tour and take a 90-minute, one-mile walking tour above the leafy neighborhoods of Wicker Park and Bucktown. The 606 is a walking/biking trail and linear park located on top of the beautifully restored Bloomingdale railroad viaduct on Chicago’s Northwest Side. During the tour, you’ll learn about the city’s railroad history and the four diverse neighborhoods that The 606 passes through. Celebrate the holidays at the 104th-annual City of Chicago Christmas Tree Lighting ceremony on November 17, 2017 in Millennium Park. From November 24-December 22, 2017, sing holiday favorites during Caroling at Cloud Gate on Friday evenings or at the Do-It-Yourself Messiah from December 18-19, 2017 at The Harris Theater for Music and Dance. Glide around the spacious outdoor McCormick Tribune Ice Rink, a Chicago winter tradition for more than 15 years. Skating is free and open to the public through early March (weather permitting), with skate rentals available for a fee. The BMO Harris Bank Magnificent Mile Lights Festival, held on November 18, 2017, is a full day of fun, kicking off with family-friendly entertainment and activities along Michigan Avenue during the day. It all leads up to the evening parade led by Mickey Mouse and Minnie Mouse, who magically illuminate a constellation of one million lights as they make their way down The Magnificent Mile accompanied by marching bands, colorful floats and giant helium-filled balloons. The festive event ends with a spectacular holiday fireworks show. 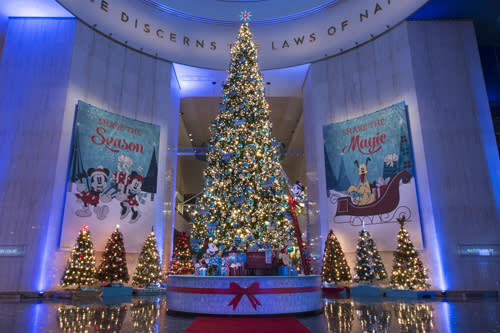 A holiday tradition since 1942, the Museum of Science and Industry celebrates its annual Christmas Around the World and Holidays of Light from mid-November through January 7, 2018. You’ll be awed by the sparkling four-story Grand Tree surrounded by a forest of more than 50 trees and displays representing the holiday traditions of cultures around the globe. On the weekends catch international music and dance performances, along with build-an-ornament workshops and photos with Santa. Make an advance group reservation for 15 or more to visit the museum and receive a discount on admission. Ooh and aah at the dazzling animated light displays during ZooLights at Lincoln Park Zoo from November 24, 2017-January 7, 2018, where you’ll also find free crafts, live ice sculpture carving and visits with Santa Claus. 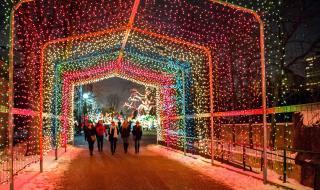 More than two million lights transform the Lincoln Park Zoo into a twinkling winter wonderland. New this year is a labyrinth of lights called Light Maze, where guests can get lost in a maze of 30,000 light bulbs. 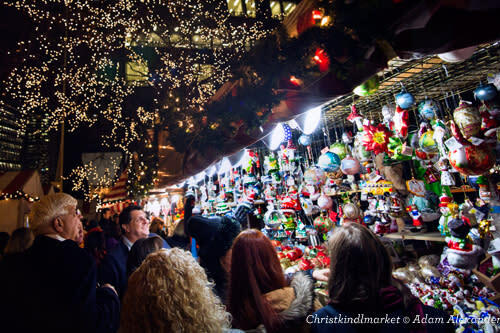 Events on select dates include Holiday Market and A Charlie Brown Christmas Concert. Beginning November 24, 2017, hop aboard a festively decorated trolley and join the Holiday Lights Tour hosted by Chicago Trolley & Double Decker Co. The 2.5-hour tour kicks off near the spectacular Christmas tree in front of the towering 875 N Michigan building (formerly the John Hancock Center), then travels through the Loop past the quaint Christkindlmarket and by the glittering ZooLights display at Lincoln Park Zoo. A free cupcake from Sprinkles makes the trip even sweeter. The trolley makes two stops so visitors can hop off and explore the sights. Private group charters are available.